KoopaTV: Petition to Abolish Daylight Savings Time! By LUDWIG VON KOOPA - It's a complete disaster. Time to end it. Yesterday mornin', the first thing I did when I got out of bed was change my alarm clock, my DS Lite's internal time, my New 3DS XL's internal time, and my Wii U's internal time an hour ahead. So 9:30? Nope, really 10:30. Oh dear, churches around the country probably lost all their congregants yesterday morning, or they all came late. I'm not going to sit here and spout that Daylight Savings Time is an Atheist conspiracy or anything. But I will say that Daylight Savings Time dooms the world, as I wrote in an article that still qualified as “Gaming Commentary” last year. Given that history of KoopaTV opposing Daylight Savings Time, let's see what's been happening across America as a result of KoopaTV's strong stance on the issue. 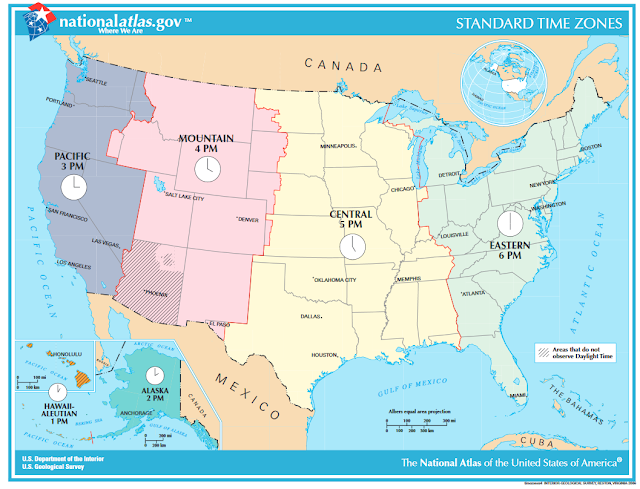 The United States of America goes over six timezones — four, if you only count the continental United States. Looking at this map in Microsoft Paint, Eastern is 370 pixels long (west Michigan to the east-most part of Maine in the top-right corner). Central is around 392 pixels wide (the left of Texas to the part of Florida that's within Central — feel free to explore that area yourself in KoopaTV's free browser-based flash game, Capture the Confederate Flag!). Mountain is about 300 pixels wide: That little part of Oregon to that half of South Dakota. Lastly, I have Pacific time at about 197 pixels wide: The leftmost part of California to the Idaho-Montana border. Speaking of California, while they're fine with sticking with their timezone (after all, most of the timezone is just California, with Nintendo and Microsoft also scheduling their events in Pacific since they're located two states above), a Democrat Party lawmaker in California, Kansen Chu, is trying to get California to opt out of Daylight Savings Time. He found a lot of things wrong with the current system of Daylight Savings Time, like how it hurts seniors. Meanwhile, in Nevada, a Republican lawmaker — Chris Edwards — spearheaded the effort to allow Nevada to stay on Daylight Savings Time forever. APPARENTLY, Nevada needs the permission of the United States Congress to fully implement this. Why the hell does a state need permission from Washington D.C. to decide how it wants to administer its time? Apparently it's because of the Uniform Time Act of 1966, which makes it so states can exempt themselves from Daylight Savings Time if it's applied to the whole state or to the state on one side of a timezone border. Apparently, that doesn't give the state the right to exempt themselves from Standard Time. Over in Kansas, Republican Ty Masterson is trying a straight application of exemption from Daylight Savings Time all year round, so Kansas would be in Standard Time. I hope it makes its way through their legislative process. I hope every state is able to act in accordance to what it wants, instead of the federal government ruining everything. I'm a states rights guy. You should sign it — it's a site that collects your personal information sends e-mails to the President and your Congressional members, sort of like when I sent e-mails to every member of Congress about remedial algebra and the debt ceiling. I'm not sure what happens if you visit it outside of the United States, though I also believe that members of the international community are also affected by America's policies. The United Kingdom and a lot of other countries in the world also have a Daylight Savings Time system in place. They implement them at different times of the year. This year, London will be going forward an hour on March 27. This makes the whole month of March particularly chaotic for KoopaTV's staff, who are scattered everywhere. You have Vortexica in Britain, and the rest of us in Koopa Kingdom, and there is a certain designated time difference between us. That's important if we try to get together to live-react to a Nintendo Direct, or if I need a staff member to quality-assure an article. How can we coordinate anything when the time is always changing? It's also difficult for readers outside of America, I'm sure. Whether it be the deadline to the KoopaTV Loyalty Rewards Program, telling you when Kamek is streaming Tom Clancy's The Division, or letting you know when during the day an E3 conference is, time zones are a struggle. It's even more of a struggle when nations/states arbitrarily change how they observe times, at different dates. You constantly need to be re-evaluating the relationship of time between this place and that place, making sure you that you really are five hours apart and that the government didn't declare you're six hours apart this week and four hours apart the next. 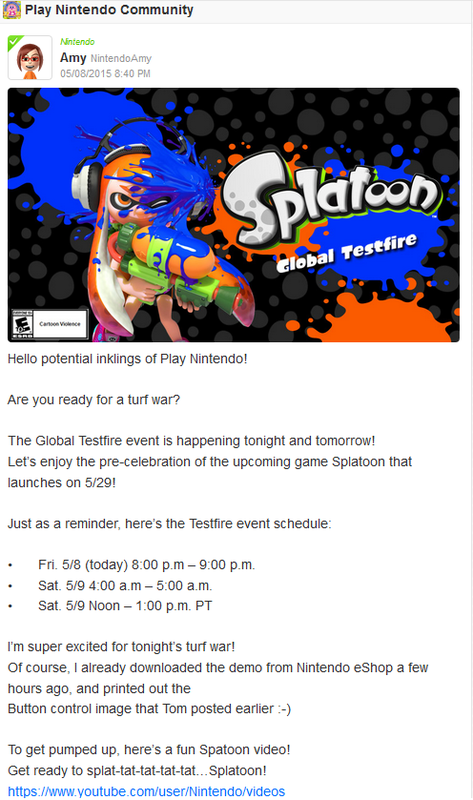 Amy provides times for the Splatoon Global Testfire's schedule in Pacific time. The Splatoon Global Testfire would not begin for another two hours and ten minutes. I really believe that shadowy forces are keeping Daylight Savings Time a thing. Why aren't one of the presidential candidates running on a platform of abolishing Daylight Savings Time? It's yet another government regulation obliterating efficiency. Are all of the candidates part of a cabal to keep America under a regime of fluctuation of time management? Is this unholy alliance even more nefarious than the one upholding the Federal Reserve?! KoopaTV will stand strong to keep time free for everyone. After America is fixed, we'll move on to the rest of the world. You can depend on us to fight for your freedom! Help fight for your own freedom, too. This is a problem that only Earthly humans have to deal with. 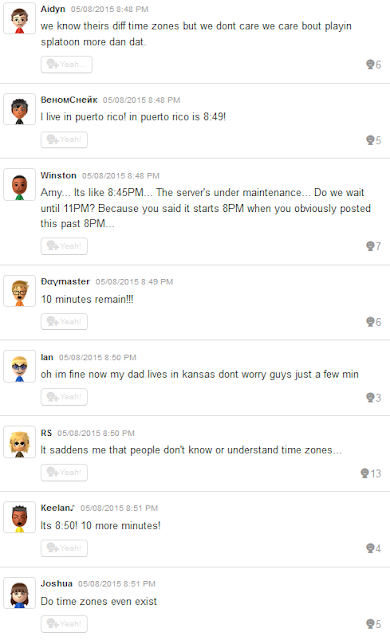 Koopa Kingdom doesn't fiddle with time. Neither does the Mushroom Kingdom, if you ignore their weird experiments with popping babies out of time machines. Still, since it affects KoopaTV's readership base, KoopaTV cares. The next step? Sending a letter to The Office of Presidential Correspondence to end Daylight Savings Time. After that? Send a second letter, since the first one went nowhere. How about letters to Senate candidates? Let's back up in 2019 and talk about how Daylight Savings Time got thought of.